Our dear brother, Fr Chris Connolly OFM died peacefully today, 25th March. May he rest in peace. A beloved member of the Franciscan community in Killarney for the past 26 years he will be deeply missed by the friars and so many people. 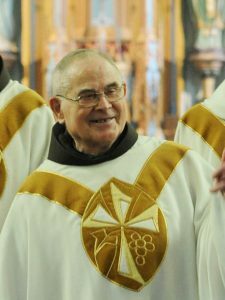 A native of Navan, Co Cavan, Chris joined the Franciscans in 1955, made his First Profession in 1956 and was ordained a priest in 1963. He served in the Irish Franciscan Mission in Zimbabwe for many years. Returning to Ireland in 1984, he ministered first in Waterford, and moved to our friary in Killarney in 1993; there he became a beloved “institution” in the town. Removal from the friary oratory in Killarney to the church at 5 p.m. this Thursday 28th March. Later, there will be a prayer vigil in the church from 7 p.m. to 9 p.m. The Requiem Mass will be celebrated on Friday at noon, followed by burial in the friary graveyard. May the Lord bring his beloved servant to glory!